Proporta has done a solid job with its line of Acer Aspire One protective cases. These affordable premium cases are a perfect companion accessory to be used with the popular netbook series. My initial reaction to the unassuming packaging the case came in was followed by reassurance as soon as I felt the smooth quality of the case material. I’m fairly recent to the world of netbooks and I have to admit case accessories weren’t high up on my wish list. But this case in particular is invaluable in both its aesthetics and ability to protect your netbook from potential damage. The delicate yet durable feel of the case is a good blend of classiness and strength of protection you would find in any premium quality protective cases. However this particular product boasts a neat little innovative design. The design allows the ability to use your system while still in the case! The workmanship is excellent and seems quite durable. The white stitching works with the black color of the rest of the case, especially since my Aspire One was also white. The case is held together by a magnetic clasp which is a lot nicer than alternative mechanisms such as zippers and velcro straps. The designers of the case were thoughtful when it comes to functionality since they even created pores on the bottom to allow the laptop to “breathe” meaning maintaining cooler temperatures. Although, I wasn’t to wild about the appearance of the ventilation pores, it servers a purpose and in the end goes pretty much unnoticed. Furthermore, there are various sized pockets suitable for holding a couple of your SD cards as well as a credit card sized pocket. A look behind those reveal an even larger pocket; ideal for holding perhaps a lint-free cloth for maintaining the Acer’s LCD screen while traveling. The careful placement of the cut outs in the leather design provide access to every necessary hardware component. Components such as the track pad, Wi-Fi indicator/switch, and card reader are all accessible through cutouts in the case. I originally assumed a case would make typing difficult, but I instead found the tiny palm rests even more comfortable with the leather covering. The simplicity and compactness makes the case an excellent accessory. There is always a slight addition of bulk with any case, but this case was just the right balance from providing enough protection without too much extra baggage. 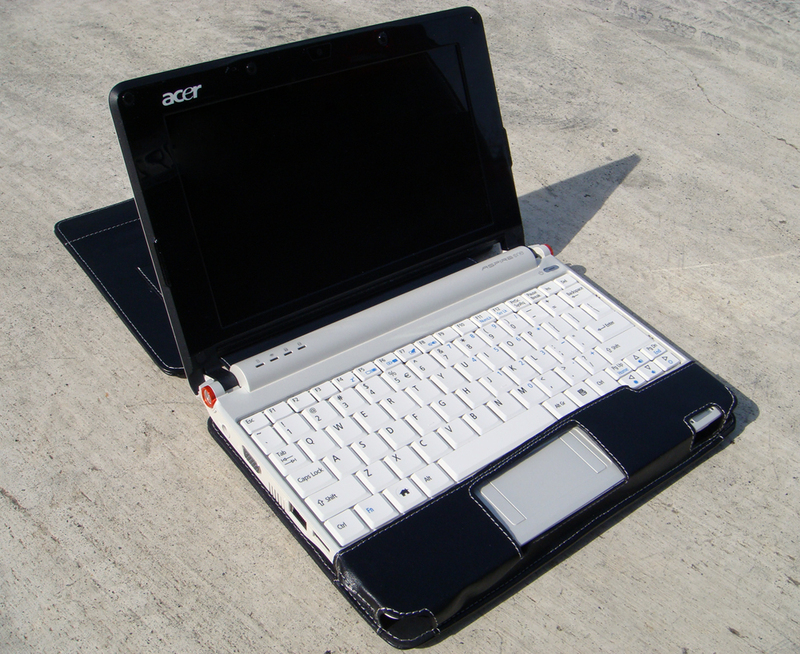 Proporta’s Leather Case for the Acer Aspire One is affordable and durable. Prior to reviewing this product I was using a generic polyester case for portable DVD players. The substantial difference was the fact that I would no longer need to create a commotion during a class lecture to take out my laptop with a noisy zippers, which is definitely a thumbs up on Proporta’s magnetic clasp design. 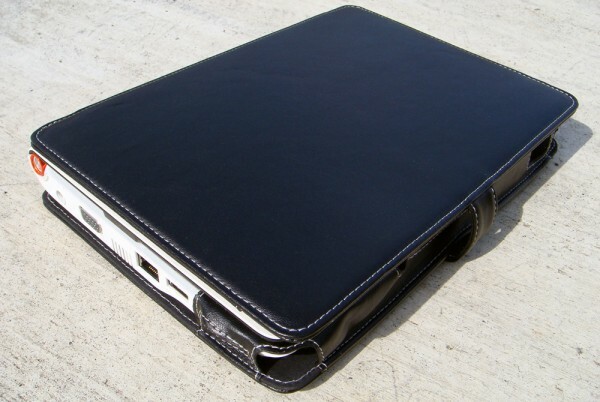 If you are in the market for a case for your netbook and enjoy the leather look, this accessory is a great choice. And if you are conscious of animal rights, Proporta delivers this to you animal parts-free! And as a bonus, as a reader of Skatter Tech, you are entitled to a 10% discount. Just enter the code “skattertech” (no quotes) during checkout. In addition Proporta provides a Lifetime Warranty on this product! i need one of these, i mean the laptop too! Anita, me too. It seems very suitable for traveling. A really need to get one and a very small laptop. do you know of a case that holds the power cable too?